Tampa forum demands “Legalization for all, stop the deportations” | Fight Back! Tampa, FL - Over two dozen activists attended a panel discussion here, at the University of South Florida in Tampa. " Legalization for all, stop the deportations!" read the banner at the front of the room. Professor Masao Suzuki of San Jose, California, an economist and expert on immigration, was the guest speaker. Professor Suzuki began the immigration panel with a report on what is happening across the country with immigration. In 2006, the House of Representatives passed the Sensenbrenner Bill, a big attack upon undocumented immigrants. The bill contained harsh consequences for being undocumented, like a mandatory $3000 fine before being deported. Also, the bill had a felony charge and up to three years in prison for friends, family members or good Samaritans housing or aiding undocumented immigrants. The reactionary Sensenbrenner bill sparked the largest marches in U.S. history, with millions upon millions of immigrants and their supporters taking to the streets of every city, big and small. This became known as the Mega-marches of May Day 2006. Suzuki spoke about the January 2013 Comprehensive Immigration Reform (CIR), which was supposed to help immigrants but took a turn for the worse. The Republicans changed it, adding more and more repressive measures, until there was more bad than good in it for the people. The current CIR bill adds more militarization at the border, more stalking at the workplace thru E-verify, more abuse of immigrant workers with the Guest-Worker Visa, an extreme wait of ten years to apply, and higher cost to immigrants. "Neither the Republicans nor the Democrats are interested in the passing of CIR at this time. And that is why we are urging those who support CIR to join forces with those pushing to put a stop to the deportations and those who are urging for Deferred Action for All, or DAFA," says Suzuki. "Not only would DAFA be an immediate relief, it would help stop the over 1100 daily deportations." The professor continued, “The executive order of Deferred Action for Childhood Arrivals [DACA] in June of 2012 allowed for some young DREAMers to have immediate relief from being deported. If DAFA was issued to the more than 11 million undocumented immigrants, DACA could be an all-inclusive sigh of relief for the undocumented." Professor Suzuki ended his presentation saying, “But we know that DACA currently isn't applicable to all DREAMers and we know that because of the current criminalizing of the undocumented, many don't qualify. If DAFA were to be ordered by President Obama, we also know not everyone would be able to obtain DAFA. That is why we push not only for DAFA but also for legalization for all of the undocumented." Veronica Juarez spoke next about the tuition equity campaign of Students for a Democratic Society (SDS) in Florida. 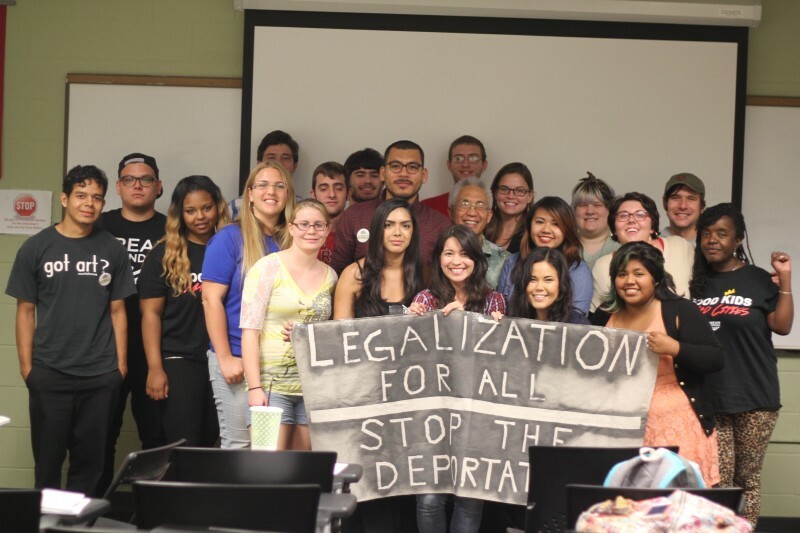 Tampa Bay SDS joined other chapters to organize for in-state tuition for the undocumented students of Florida. As it currently stands, undocumented Florida students pay 3.3 times as much as other students they went to high school with. SDS organized call-in days, campus speakouts and a big rally in the Florida State Capitol in Tallahassee demanding politicians take action and make education affordable and fair. "It wasn't until we started having rallies, speak-outs and actually organizing affected students that we saw bills like Senate Bill 1400,” says Veronica Juarez of Tampa SDS. SB 1400 allows a DACA student to pay the same tuition rate as all other resident students of Florida. SB 1400 is well on its way and moving forward, having already passed the Judiciary portion needed to come into effect. Juarez pointed out two glaring problems, "The thing is, even though SB 1400 would make tuition more affordable for undocumented students, two bad amendments were sneaked into the law; the first being that the student would on paper, still not be a ‘resident of Florida’ and the second is that a student would have to be enrolled in a Florida high school for 24 consecutive months. This means DACA students who are migrant farm-workers would be most affected. Migrant families are forced to move with the changing crop seasons across the U.S."
Marisol Marquez of Raíces en Tampa rounded out the immigration panel saying, "In Florida we saw that the majority of deportations involved the police using driving without a license as an excuse to detain and eventually deport. We wanted to help stop deportations and knew that if we pushed for Florida to issue drivers licenses to all of the undocumented, we could help." Raíces en Tampa is working to unite with other groups around Florida and create a buzz about driver's licenses for the undocumented. Raíces en Tampa created a campaign page called Driver's Licenses for All Undocumented - Florida and is seeing a building movement around Florida. "We take a table and place it where we know there will be people interested. We walk around and ask people to come show their support!" says Marquez, describing how Raíces en Tampa has been able to go viral in the immigrant areas of Florida. "The people want to be able to drive without looking behind their shoulder and without fearing they will be torn away from the years they have put into trying to create a life for themselves in Florida." The organizing in the Tampa community is a completely new experience for some. "As an undocumented individual, being with Raíces en Tampa gives me not only a sense of identity, but the strength to continue fighting for everyone's dreams,” says Cristian Cintora, one of the newest members of Raíces en Tampa. Those in attendance were able to pick up free literature, buttons, information and even know-your-rights pamphlets from various groups including: Tampa Bay SDS, Raíces en Tampa, and Freedom Road Socialist Organization. Activists gathered for a picture and held up the banner, "Legalization for all, stop the deportations!" Marquez finished the event, announcing, "Future actions for Raíces en Tampa include coordinating May Day events in many cities to call for a stop to deportations, legalization for all, and for Florida politicians to issue driver's licenses to all of the undocumented. We hope everyone can come out or show their support by signing our petition."